The M LINE FACTORY offers a new type of modular machine architecture which offers an unprecedented level of automation and innovation, that allows economical series production on an industrial scale. The X LINE 2000R is the world’s largest metal melting machine (160 l build volume) for the toolless manufacture of large functional components and technical prototypes with series-identical (also reactive) material properties. The highlights include automated powder transport, which can even be used during an ongoing build process. Consequently there is no need at all for an operator to handle the powder. In addition, the X LINE 2000R has a rotating mechanism so that two build modules can be used reciprocally, thus guaranteeing constant production without any downtimes. 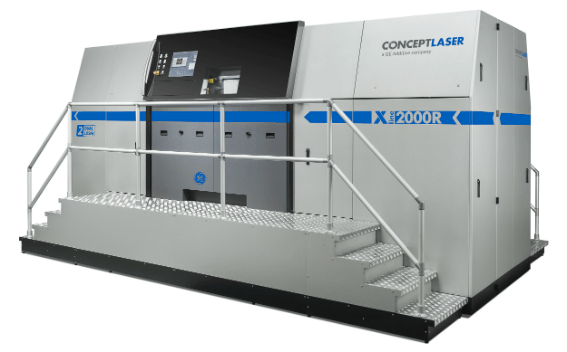 The centrepiece, the dual laser system, operates with two lasers that each output 1000 W.
The basic idea is to physically decouple the machine units used for part production and for set-up and dismantling processes. These tasks can now be carried out in parallel and physically separately from one another thanks to the modular architecture. As a result, current stoppage times for the machines, as a result of manual processes such as supplying or exhausting metal powder, are reduced to a minimum. This will deliver considerable time and cost savings. The M LINE FACTORY PRD is the production unit, consisting of the dose, build and overflow modules, whereas the M LINE FACTORY PCG, the processing unit, is responsible for set-up and dismantling processes as well as powder management. In addition, any number of machines can be linked together, thus creating fully automated machine networks that “communicate” with one another. The M LINE FACTORY forms the core element of our production concept of the “AM Factory of Tomorrow,” which also envisages linking up with traditional manufacturing methods, e.g. in the post-processing of the parts. The concept consistently implements the basic idea of “Industrie 4.0” with a focus on delivering a “smart factory.” Consistent automation, interlinking and digitization of all processes ultimately allows the economical series production of additively manufactured metal parts.